Video surveillance and motion capture software. 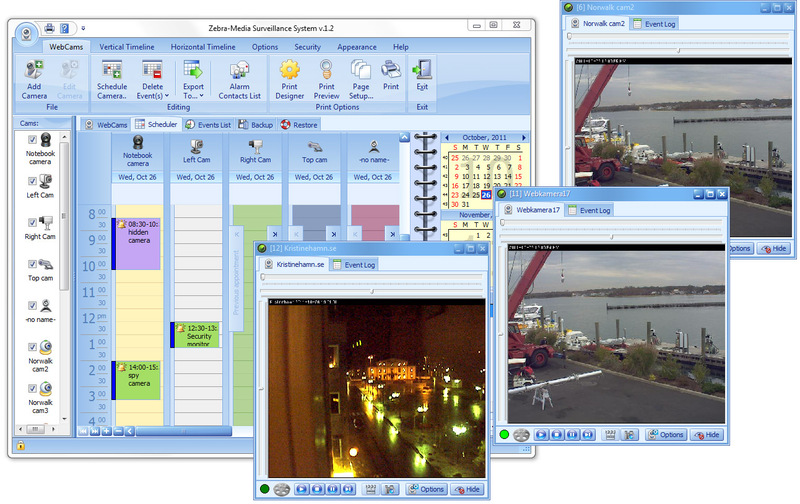 Some key features are: unlimited cameras (including IP and USB cameras), motion detection, SMS and MMS and Email alerts, play sound file (useful on motion detection), adjustable sensitivity for each zone, record on detection, save video into archive or file with automatically or manually selected compression, record on schedule, registration of all events continuously by intervals or on motion detected, password protection, adding a text, time stamps, watermarks to your video. For each video frame, if motion is detected, the Alarm event occurs, that returns a global motion ratio, depending of the number of cells in which motion has been detected, and the level of motion in each cell. A sensitivity grid is applied on video frames. You can adjust the sensitivity of the detection, and mask out areas of the camera view to avoid false alarms. When the camera captures video frames in a dark environment, it is possible that the electrical background noise of the CCD video cell creates fake motion detection events. It is possible to reduce the sensitivity of to the video noise by enabling the Reduce Video Noise option. When an alarm condition is detected, the program can sound an audible alarm, or send you an email with a photo. Automatically capture photos, or record video in compressed files. Surveillance System includes an advanced player that allows to play video clips, capture video frames and perform frame overlay. Each camera has its own individual monitoring and recording settings. All settings, such as alerts, photos, and video recordings can be turned on and off using the built-in scheduler. All monitoring and alert events are logged with date and time stamps. Each camera has its own scheduled on(off) times. Building upon the interface options introduced in MS Outlook, scheduler includes event recurrence control and customizable Date Navigator. Access to all data is provided through a well encrypted password. Just a small bug fix release.